This entry was posted in Interviews and tagged Effraim Catlow - Ride On Full Length Interview by Effraim. Bookmark the permalink. 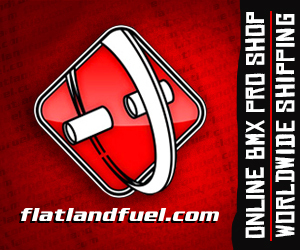 Thank you Effraim for everything you have done and still do for Flatland BMX. Great listening to you Effraim. You really seem to have an insight into the scene. I realized years ago to,about what you said about how flat’s become ‘elitist’, & it being disssapointing. The fact that you speak your mind, stand up for what you believe in, & in making a statement to the Xgames by starting Flatmatters, telling your sponsor you quit. And just the fact you said ‘a rider named Pete Brandt’, gives me the impression that you don’t just ‘assume’ everyone knows him,so all of the above and you helping the next generation of riders, etc, I admire what you have and continue to do. Keep it Effraim. Much respect!!!! It’s been 15 years since I rode Flatland the last time, but seeing this interview brought me goose bumps. Flat matters. This is the FIRST video I watched to kick off New Years day……….PROPER ! Seeing / hearing it again was mint , cant believe all that effort , selfless energy , and love that your parents put into K.O.C. , Big -E . Ive only set up a simple jam back in 2004, and it was a task for me just calling all the riders , hahaha . That first combo ! Ive always had to watch this interview twice when viewing it . Once to watch / bug out on your combos , even the stuff you were throwing down at such a young age , candy bar ankle death for example , and half packers ! Hell bruv , I was doing and STILL sketching half packers yesterday ! Im 44 , hahaha. Not to mention your smooth rolling lines , X-leg flavor , aboard the Deco frame . Love that era in your riding ! Also I think its sick your pops being an artist , how you two can vibe on that level about each others passion , REALLY digging that . So many key topic in this that are so in the know makes your interview in this SLLLAAAAAMMMED , Effraim . Cheers , campeon ! Looking forward to another 10 years of F.M. , your new combos , and all the dope , hand picked exclusives on this site ………..Now if only I can find my copy of K.H.E. , the Parade bmx team V.H.S. tape , YOUR section ! That section was my first time seeing your riding on video and got me hooked on your riding at the same time , Jefe ! !